In May, Vanuatu Tourism Office Australia co-hosted a five night trip to the main island of Efate and capital Port Vila with Infinity Holidays taking 10 Flight Centre Group consultants from Victoria. The group, also supported by Air Vanuatu, stayed at Warwick Le Lagon; Iririki Island Resort and Spa; and Holiday Inn Resort Vanuatu. 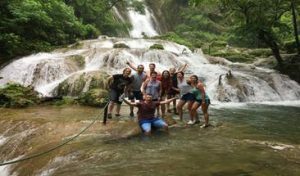 The group enjoyed activities including horse riding with Club Hippique, ziplining through the jungle with Vanuatu Jungle Zipline and swimming in the pools at the Mele Cascades. They were also treated to hosted meals at Breakas Beach Resort; The Beach Bar and Restaurant; and Mangoes Resort Restaurant and Bar.